While one may not find Odin when entering the SimBLISSity 35’ Valhalla, you will find the comforts befitting the Gods. 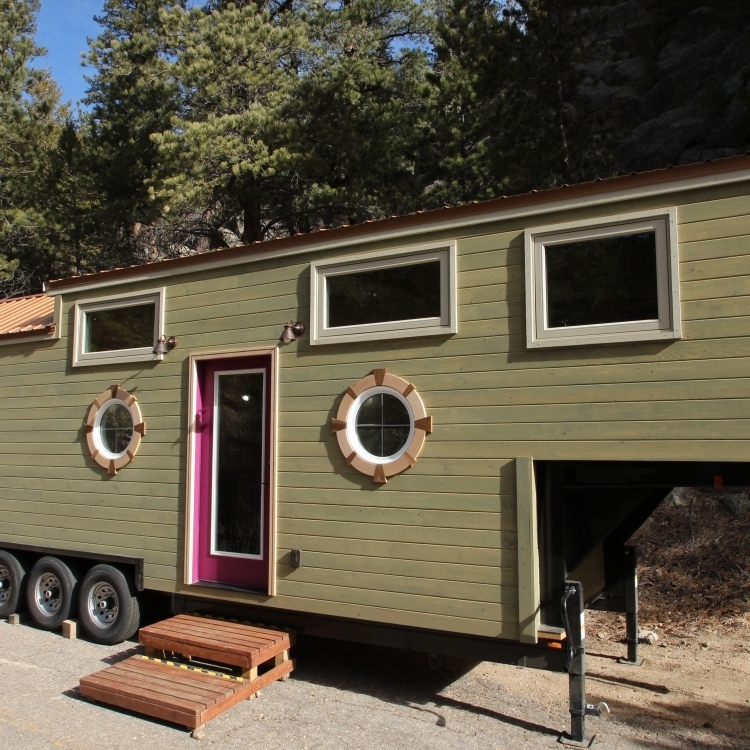 The Valhalla is a deluxe, custom built Tiny Home that invites you in to enjoy its spacious and bright atmosphere. 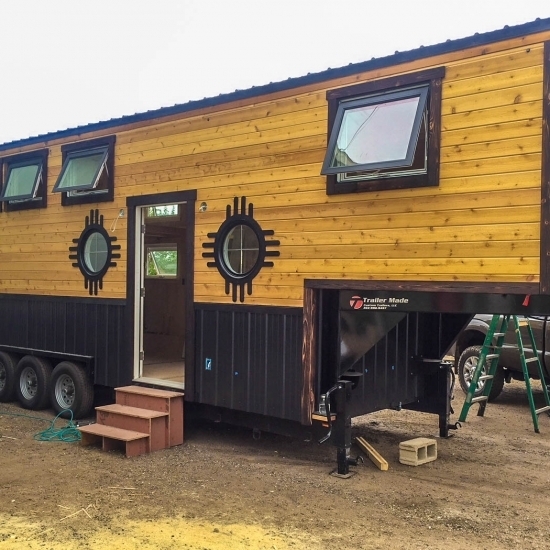 This Tiny Home is built upon a 28’ gooseneck Trailer Made trailer and has a 7’ deck loft which provides a bedroom with more than 6’ of headroom. The open floor plan provides a Great Room with an exotic lounging nook incorporating an L-shaped sofa that is designed for snuggling and entertaining guests. 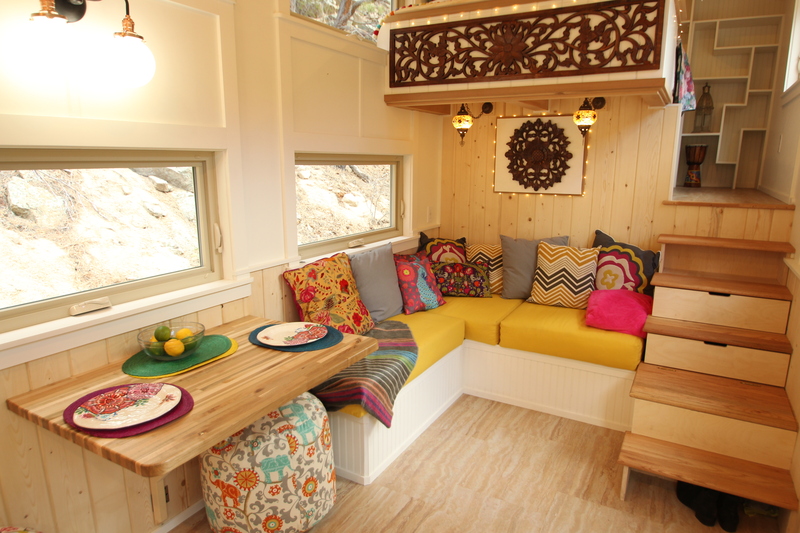 The comfortable sofa has lots of built-in storage and is adorned with stained glass pendant lighting. Tongue and groove pine wainscoting add to the elegant atmosphere. Gold-tone cork flooring softens the entire room. Clerestory windows provide refreshing ventilation and a wealth of natural light. The fold-down acacia butcher block table allows four people to enjoy a scrumptious meal that has been prepared in the large kitchen. The generous sized, galley-style kitchen has a large ceiling, high pantry, acacia butcher block counters on both sides allowing for the finest of gourmet chefs to prepare tasty morsels of food. There is abundant cabinet space, a stainless steel three burner gas range with oven, a hammered copper sink, and an Energy Star rated refrigerator. Step into the bathroom and the feeling of a Turkish bath prevails. The specially designed glass enclosure ensures a comfortable shower with never-ending hot water provided by the Rinnai, Tankless, On-Demand hot water heater. 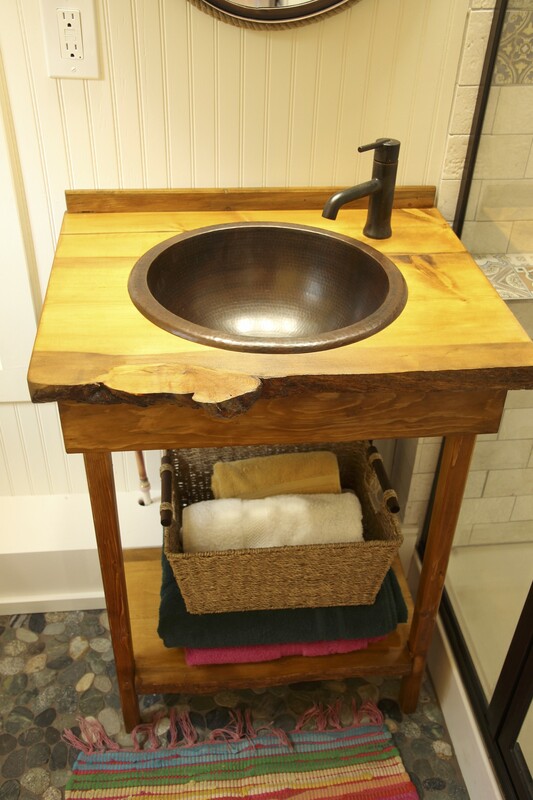 Upon a “live edge” counter sits a hammered copper sink enhancing the bathroom vanity. 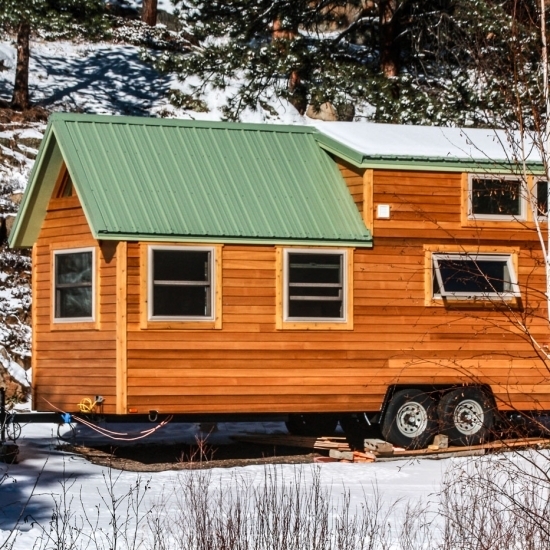 Nature’s Head Composting toilet ensures that this Tiny Home only produces gray water. 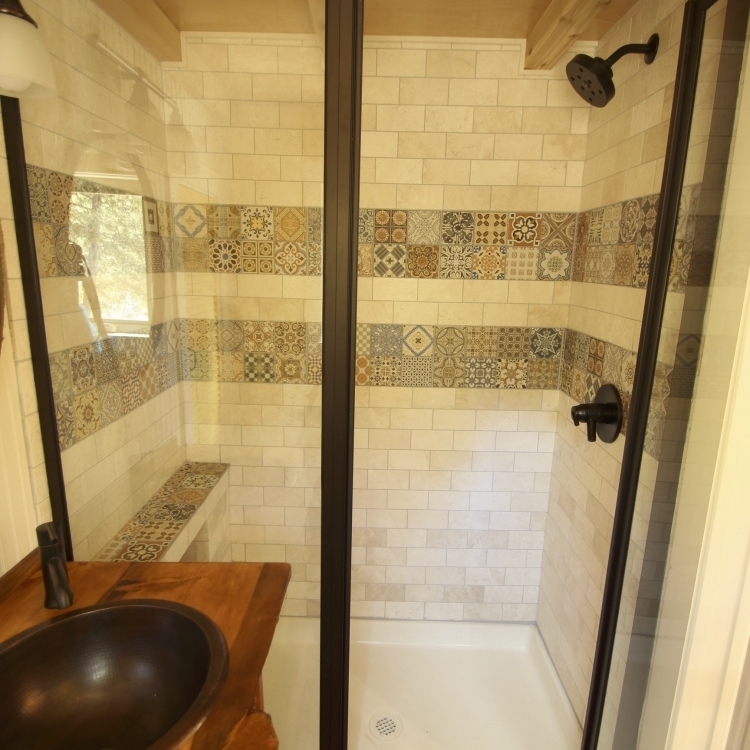 The river rock floor adds elegance to the bathroom. 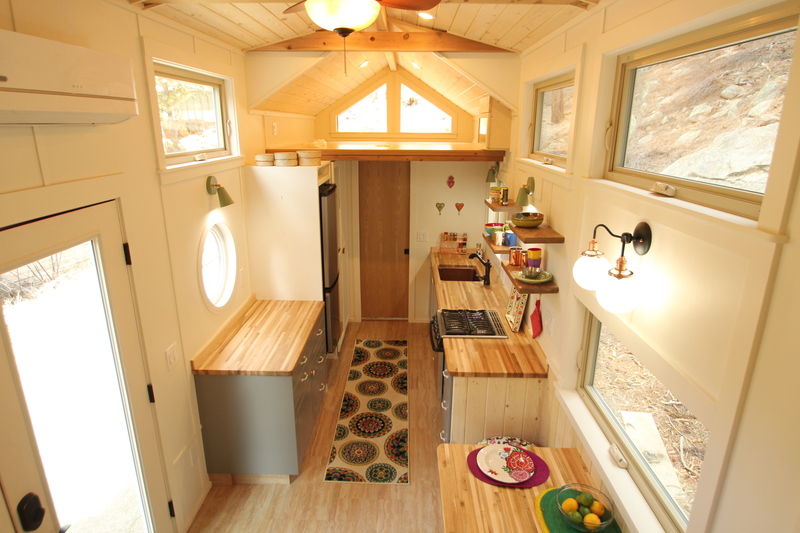 Above the Kitchen and bathroom is an 8’ X 10’ loft that can be used for sleeping and storage. At the front of the SimBLISSity Valhalla is a stand-up sleeping loft which accommodates a queen sized bed and lots of storage shelves. The Energy Star rated windows provide abundant cross-ventilation for restful nights. 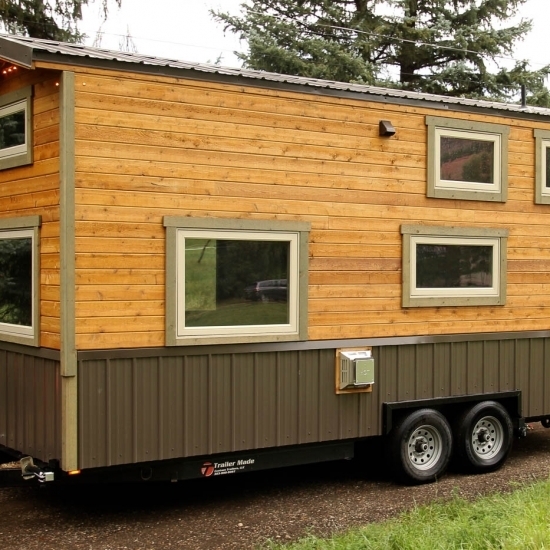 The exterior is sided with tongue and groove pine stained to fit in with natural surroundings. Two custom-framed, round windows enhance the entrance. 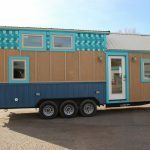 The SimBLISSity 35’ Valhalla may be the most elegant Tiny Home that SimBLISSity has ever built and will be featured in an upcoming episode of Tiny House Hunters. Insulation: R-24 – R-28, High altitude formula, Anti –Bacterial, sprayed in Closed cell foam.